It might seem logical that the more your employees work, the better off you and they will be. After all, having everyone in the office means everyone’s being productive and helping your business grow. But the statistics say otherwise. When employee engagement is low – and that’s something almost every company struggles with – so is productivity. Despite your best efforts, only about one-third of your employees are fully engaged at any given time. And that’s a serious problem. So what’s to blame? Burnout, exhaustion and stress are often the culprits. When an employee is consistently putting in long hours or working for weeks on end without a break, he’s mentally and physically drained. But even those employees who aren’t burning the midnight oil are susceptible to burnout. And the fact remains that many U.S. employees – about half of them – are leaving vacation days on the table. The reasons why employees choose work over play are many. Some suffer from feeling a need to always be “on” and can’t seem to get out of work mode. Others worry that they’ll get behind in their jobs, or that they’ll jeopardize their career progression. If there are whispers about layoffs or a company sale – and these things are pretty common nowadays – it’s understandable why an employee might fear taking time off. And if employees don’t see executives or business owners enjoying regular breaks, they may feel they’re expected to abstain as well. Even those employees who do take vacation time are likely working during their days off. In our hyper-connected, always-on world, it’s hard to unplug completely. Whether because they choose to or feel they have to, 30% of employees work while on vacation. And despite their seeming work ethic, it isn’t something to celebrate. While having a full staff every day may seems beneficial to your company, if many of those employees aren’t fully engaged, it’s just an illusion. And it’s costing you in ways you may not realize. When employees are engaged, they’re 28% more productive. So it stands to reason that when they’re stressed or tuned out, they’re less productive. And you don’t need an MBA to know that’s not a good thing. Did you know that businesses like yours are losing $300 billion annually because of low productivity? When you’re paying employees to work inefficiently or redo work that wasn’t done right the first time, you’ll eventually feel it in your pocketbook. So, how you improve productivity? The answer may surprise you. You know the feeling you have after a nice, long vay-cay. You feel rested and relaxed. You feel calm and centered. You’re not triggered by the little stuff. You have a level head and a clear mind. You’re in a good place, and that’s a great thing for your productivity. The same applies to your employees. Time off work gives them a chance to disconnect and recharge. The benefits of taking time off begin before the actual vacation does. Just planning for a holiday can make people happier and more motivated as far out as eight weeks beforehand. When they do return, your employees are often more creative and motivated. Sometimes getting away from a work challenge is the best way to discover a fresh and innovative solution to it. And those good vibes can stretch for months after the vacation. 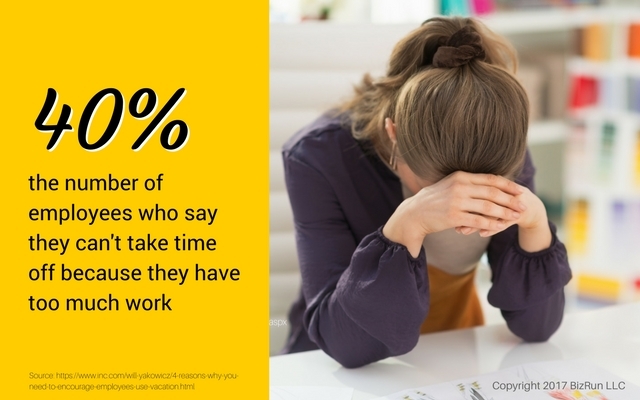 With all the positives of taking time off, it’s hard to believe more employees don’t take all of the time available. Here’s how to change that. The best way to get your employees to take time off is also the simplest. Encourage them to. But just because it’s simple doesn’t mean it’s easy. For starters, be sure you aren’t subtly or not-so-subtly discouraging your employees from taking regular breaks. Are you setting a good example? If you work every weekend and disseminate emails at midnight, you’re not sending the right message. Start by examining your own habits and making your own time off a priority. Next, look at your managers. Are they knowingly or unknowingly thwarting your employees’ attempts at vacation? Be sure you give your managers the support they need to adapt around employee absences and to take their own breaks when needed. You could also consider revisiting your time off policy. If it’s prohibitive or unclear, this will be time well spent. 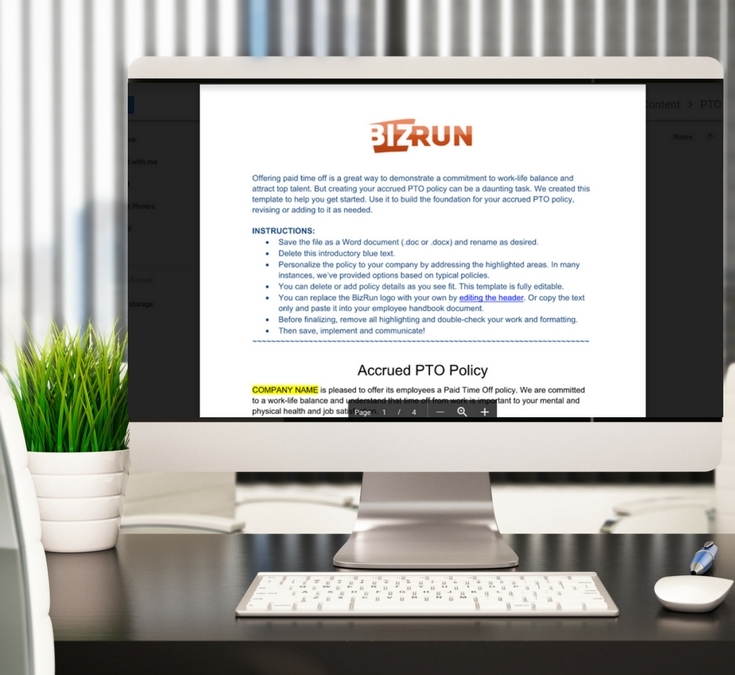 If a burdensome time off request process is partly to blame, there are HR software tools that can make it so much easier for you and your employees. When your employees actually use their time off benefits, the benefits are felt by everyone. Your people will be more productive and engaged. And you’ll have a healthier bottom line. Heck, you’ll probably even be healthier yourself when you experience firsthand the power of a good vacation. Get a jump start with our FREE template! YES, SEND ME THE TEMPLATE!